While coding a class file, you might encounter situations where you come to know that namespace is missing and you need move to top of file and add a namespace by "using" keyword. e.g. 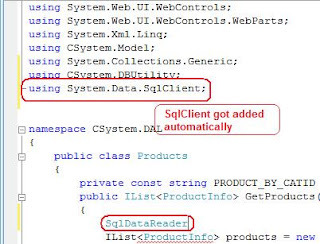 you are writing a DAL (Data Access Layer) and have to create a variable of "SqlDataReader". Suddenly you recognize that "System.Data.SqlClient" is missing (its a pain sometimes..). In this case you need to move top and type there. Below is the shortcut for this problem. 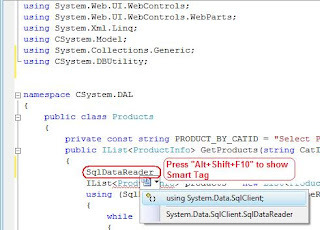 Taking above example, type SqlDataReader and press "Alt+Shift+F10" and press enter to create a namespace automatically. Press "Alt+Shift+F10" to show Smart Tag and press enter to select first option. Let me know your comments..
gud shortcut lists you have..do you have some for vs 2008?